Child's hands holding cross during first communion. Fresh flowers given to a child for making her first Holy Communion are a rite of passage. 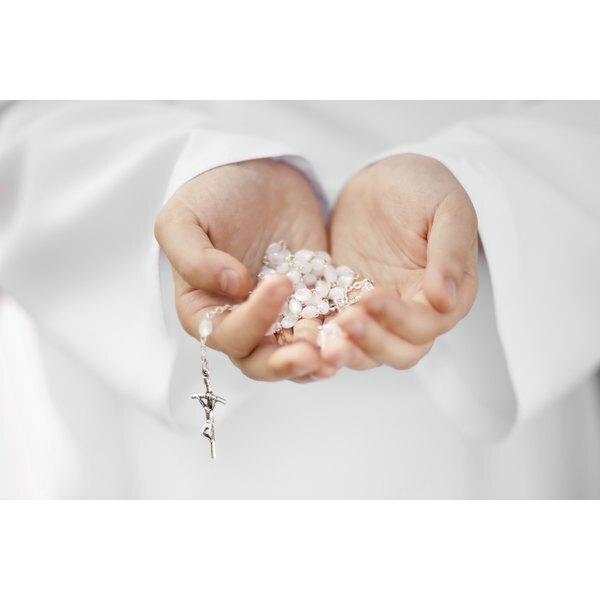 On her first Holy Communion day, a girl grows in her faith in the Catholic Church and celebrates receiving the body and blood of Jesus for the first time. Typically, first communions are cerebrated in the springtime so flowers are abundant and in season. Color selections should be made according to preference, but there are some bouquets that hold up better than others for a busy day filled with activities. White roses symbolize purity and innocence, making them the ideal flowers for a girl’s First Communion. Ask your florist for a miniature bouquet for picture taking. One or two cut white roses also make for an attractive wrist corsage. There is no set rule on specific colors used. You can combine as you like. Try mixing in a yellow rose or two, which represents happiness and friendship. Adding a pink rose to the bunch will symbolize joy and grace. Roses stay fresh-looking for a few days. After that, they will droop, so schedule to pick up the bouquet early that morning. Once the day is over, you can easily press the roses into a scrapbook for memory’s sake. By nature, carnations are a low maintenance flower. They look pretty, fresh and tend to last a long time. Most stay crisp-looking for two to three weeks. If you place the cut flower in water after the ceremony, the carnation will last even longer and can be a nice addition to the family table for a couple of weeks. Pink and white carnations are the most common types of flowers used in communion bouquets and corsages because they are so resilient. One small white carnation pinned to your son’s suit jacket is the perfect addition to the wardrobe. Lilies are innocent flowers that smell great, but they are also very delicate. If your child is very active, consider a sturdier flower. Some people have strong reactions to the scent of a lily. If your child is sensitive to smells, it is better to choose a flower that gives off the least amount of scent. 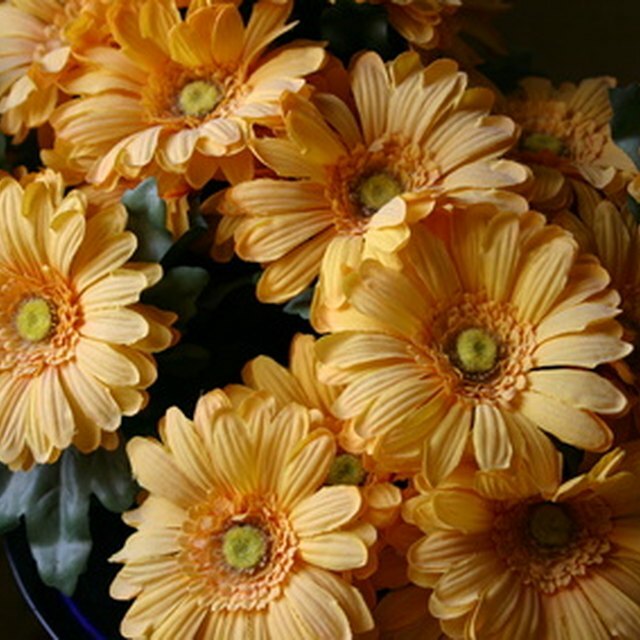 Daises are easy to care for and require very little maintenance. They make nice, affordable additions to spring flower bouquets. Sunflowers are a type of daisy that are more durable and also look pleasant for spring occasions. No matter what type of flower combinations you choose for your daughter’s bouquet, include baby’s breath in the bunch. Baby’s breath plants are delicate little bits of shrubbery that produce dainty, white flowers.